Our parish’s fall General Assembly meeting will be held in the coffee room on Sunday, April 23, 2017, after the Divine Liturgy. In order to proceed with discussion and consideration of the matters on the Agenda, we must have a quorum of at least 25% of the total number of Parish members who are in good standing by having met their financial obligations as Stewards of the Parish as of April 21, 2017. Please be sure you have filled out a pledge card and are current in your stewardship by April 21st, 2017, in order to participate. Your input and vote are very important! Potluck Lenten luncheon after service; wine, oil, and fish permitted. Please bring a dish to share. 9 April, Palm Sunday evening: Bride Groom Service 6:00 p.m.
10 April, Holy Monday: Bride Groom Service 6:00 p.m.
11 April, Holy Tuesday: Bride Groom Service 6:00 p.m.
12 April, Holy Wednesday: Holy Unction Service 6:00 p.m.
13 April, Holy Thursday: Vesperal Divine Liturgy 10:00 a.m.
13 April, Holy Thursday: The 12 Gospels and Nailing on the Holy Cross 6:00 p.m.
14 April, Holy Friday: The Great and Royal Hours 9:00 a.m.
14 April, Holy Friday: Decorating the Kouvouklion 10:00 a.m.
14 April, Holy Friday: The Apokathelosis (Un-nailing) 3:00 p.m.
14 April, Holy Friday: The Lamentation 6:00 p.m.
15 April, Holy Saturday morning: Vesperal Divine Liturgy 10:00 a.m.
15 – 16 April, Holy Saturday night — Pascha: Orthros 11:00 p.m., 12:00 a.m. Divine Liturgy. Potluck Anastasi meal after service. Fast-free—please bring a dish to share. 16 April, Great and Holy Pascha: Agape Service 12:00 p.m.
Potluck Agape meal after service. Fast-free—please bring a dish to share. The next Parish Council meeting will be Sunday, April 2, after the Divine Liturgy. A one-year memorial service is offered this Sunday for Tracey (Anastasia) Tramontanas by Dr. Kyriakos (Kerry) Tramontanas and her son, Andreas Tramontanas. May her memory be eternal. Please fill out forms, available in the back of the church, to order Lily plants for Pascha. Each Lily plant is $15. Purchase in memory of a loved one. Deadline for orders is Palm Sunday, April 9. We will begin selling our traditional sweet bread for Pascha this year after the service on Palm Sunday, 9 April. The price is $12.00 for each tsoureki. Fish will be provided by Parish Council. Please bring a side dish or dessert. The sign-up sheet is downstairs in the coffee room, or you may contact April Dellas at (505) 466-1340 (home), (575) 684-0125 (mobile), or ridingsecret@aol.com. Food must be Lenten, though oil, wine, and fish are allowed on Palm Sunday. On the Saturday of Lazarus, 8 April, after the Divine Liturgy, please stay to make Palm Crosses and to clean the church in preparation for Holy Week and Pascha. Sign up to bring a dish for our annual Anastasi potluck meal after the midnight Pascha service. The sign up sheet is downstairs in the coffee room, or contact April Dellas: (505) 466-1340 (home), (575) 684-0125 (mobile), or ridingsecret@aol.com. Sign up to bring a dish for the potluck meal that will be shared after the noon Agape service on 16 April. The sign up sheet is in the coffee room, or contact April Dellas at (505) 466-1340 (home), (575) 684-0125 (mobile), or ridingsecret@aol.com. Father needs readers to read the Gospel in different languages for the Agape service on April 16. WE NEED YOU! – The consecration of our beautiful church will take place September 2, 2017. We have a weekend of activities scheduled and need everyone’s help in making this weekend as special and stress-free as possible. Please consider helping us in any way you can. Sign-up sheets are located downstairs in the coffee room. Help is needed in many different areas for the next five months. Consecration Book – PHOTOGRAPHS NEEDED BY APRIL 30th. We are looking for photographs to document the history of our church. Please let us know if you have any photographs of our church, events, festivals, celebrations, that you can share. You can email digital photos to tboone@ekkoranch.com. If you have photographs on paper, please bring them or mail them to the church. We will scan them and return them to you. Please contact Tonya Boone at tboone@ekkoranch.com for more information. faint-heartedness, lust of power, and idle talk. humility, patience, and love to Thy servant. Recently, Fr. Dimitri handed out copies of the Lenten Prayer of St. Ephrem The Syrian, shown above. We have added a “Donate Now” button at the top of the right hand column of our web pages. Clicking on the button takes you to our donation page on the JustGive.org web site. You can make one-time or recurring monthly donations by credit card for St. Elias. You can set up monthly stewardship contributions, so that the church receives your donation, even when you’re not able to be there. We are faced with a difficult economic situation, and your donations are greatly needed. Please give generously. To make a one-time donation, be sure to uncheck the box on the web page form next to “Make this a monthly recurring donation,” otherwise, your credit card will be billed monthly until you cancel it. Your donation, less 4.5% that goes to JustGive.org, will be received by St. Elias. Your entire donation is a tax-deductible donation to JustGive.org, and your donation will show up on your credit card statement as a charge by JustGive.org. Be aware that it may take up to 6 weeks for your donation to be received by the church. JustGive is a 501(c)(3) nonprofit organization whose mission is to increase charitable giving by connecting people with the charities and causes they care most about. The cost of donating on JustGive is 4.5% of the amount of the donation, which includes a 3% charge levied by the credit card company and 1.5% that goes toward JustGive’s overhead. To learn more about JustGive, click here. Since the donations are made through JustGive, you will see their name on your credit card statement. They will email you a tax receipt for your donation, and they will send the donation, less 4.5%, to St. Elias the Prophet Greek Orthodox Church. When you file your taxes, report the entire donation as a tax-deductible donation to JustGive. Our Fall Parish General Assembly will be held on Sunday, November 20, 2016, shortly after the Divine Liturgy. It is important that members attend to help decide on parish business and to ensure we have a quorum. Please attend to stay abreast of parish activities and share your ideas. To download a copy of the agenda, please click here. St. Elias Feast Day Celebration at Our Church! After the Divine Liturgy on Sunday, August 21, we will celebrate St. Elias’ Feast Day at our church! Spit-roasted whole pig and other delicious food will be served. There will be Greek music and dancing. Cost will be $20 per person. Please come! We need volunteers to bring Coleslaw, Baked Beans, or Orzo Salad. A sign-up sheet is in the coffee room or sign up with April Dellas (ridingsecret@aol.com). Orthros will begin at 9:30 a.m. that Sunday, and the Divine Liturgy will begin at 10:30 a.m. A recipe for a 25-serving batch of Coleslaw is given below. Combine all of the sauce ingredients in a large bowl. Mix until smooth. Season to taste with salt and pepper. Fold in the vegetables until they are well coated with sauce. Adjust salt and pepper, as needed. Cover and refrigerate till ready to serve. The 2016 Santa Fe Greek Festival will be held on Saturday and Sunday, June 11 and 12, at the Santa Fe Community Convention Center, 201 West Marcy Street, in downtown Santa Fe. Festival attendees will enjoy Greek food, music, and folk dancing. There will be a silent auction with a wide variety of items and services to bid on, two cash raffle contests, a Greek Agora market, and a variety of merchandise vendors. Please come and help make the 2016 Santa Fe Greek Festival the best ever! 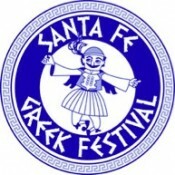 See our web pages under the Santa Fe Greek Festival tab for more information. Deacon David Mascareñas has gone to sleep in the Lord after an extended illness. The Memorial Service will at 11:30 a.m. this Saturday, 12/12/15, at All Saints of North America Orthodox Church, 10440 4th Street NW, Albuquerque, NM 87114. The V. Rev. Gabriel Rochelle will officiate the service. After the service, burial will be at Vista Verde Memorial Park, 4310 Sara Rd SE, Rio Rancho, NM 87124. May his memory be eternal. It is an Orthodox tenet that at certain times there is to be NO MOVEMENT in the church. These times are during the Six Psalms at Orthros and at Liturgy during the Gospel, the Small and Great Entrance, and during the Consecration of the Holy Gifts. Please abstain from movement at these times. Our Greeter will let you know when to move to your seat. As a Christian community attending a very important sacrament, the Divine Liturgy should receive our greatest respect. Please refrain from apparel that is considered beach wear such as shorts (both men and women), skimpy tops, and/or mini skirts. Apparel that is modest and tasteful is what our Bishop recommends. Please observe the proper preparation for receiving Holy Communion. As a rule, arriving after the Gospel is read means you have not prepared for the sacrament of Holy Communion according to Orthodox principles. Who is St. Elias the Prophet? Sundays | Orthros/Matins: 9:00 a.m.; Divine Liturgy: 10:00 a.m. Weekdays (as announced) | Orthros/Matins: 9:00 a.m.; Divine Liturgy: 10:00 a.m.
Saturdays (as announced) | Orthros/Matins: 9:00 a.m.; Divine Liturgy: 10:00 a.m.; Vespers: 5:00 p.m.